UK stores are refusing to stock a mobile handset aimed at the elderly because it "fails to fit their customer target", says the phone's distributor. Stewart Smith, head of Communic8, also says that he had found no network operator prepared to partner with the makers of the Emporia Life handset. 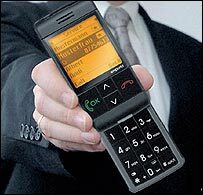 The £170 handset features easy-to-use buttons, a simple display and a large red panic switch on its back. 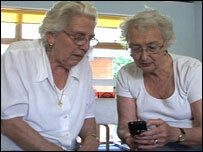 Charities for the elderly have accused the mobile industry of ageism. Austrian-based manufacturer Emporia are aiming the phone at the over-50s but, despite a large potential market, has found it a hard sell in the UK. "We are in discussion with a number of retailers, but particularly when it comes to the mobile networks, they find it hard to see where this kind of device fits within their brand," said Mr Smith, managing director of the UK distributor Communic8. "Currently they're very much driven by the youth market or the business sector because that's where they make their revenue. It's difficult to see where a product like this would fit within their portfolio," he added. Gordon Lishman, director general of Age Concern, accused the industry of ageism. "The fact that high street stores aren't interested in stocking a phone product specifically targeting older people, shows an ageist approach to their potential customers. These stores are missing out on a big, and growing, market if they don't cater to older people," he said. 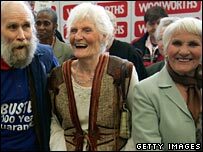 O2 denies any accusation that it is discriminating against older people. "That is absurd. We already offer a handset that is ideally suited to older people. We don't directly market it at them because that would be a bit patronising," said an O2 spokeswoman. O2's Jet handset features a simple user interface and boasts long battery life. It is available on either a monthly pay plan or for a one-off payment of £59.99. At £170, the Life Phone will be pitted against cheaper competitors, some of which can cost below £25 and are packed with more advanced functions. Mr Smith believes that price will not be a barrier. "The comments that we've had so far are very positive. They've found a device that's finally accessible so actually what we're finding is price is not an issue," he said. The Life Phone's design is a concerted attempt to target the senior citizen market. What few functions it has have been simplified as much as possible. Its unique feature is a prominent red button on the back that allows it to dial up to five designated numbers, such as a doctor, emergency services or nearby relatives. It also has an orange screen, designed to be easily read by people with poor eyesight. At present, because no UK high street retailer will sell the Emporia Life, it is only available online either directly from Communic8 or the Royal National Institute of Blind People. It comes pre-packaged with a pay-as-you go SIM card.